The brand new freehold luxury condominium project, Boulevard 88 has managed to sell a total of 20 units during private previews. According to developer City Developments Ltd (CDL), most of the units sold were 4-bedroom apartments and the total sales sum up to more than $160 million, with a median per square foot (psf) price of $3,350. It was also noted that about 60 percent of the ones who bought are Singaporeans, while the rest is being made up of permanent residents and foreign buyers who were mainly from China, Indonesia and also the United States. Boulevard 88 is a 154-unit high-end residential component of a mixed development which also comprises of the Singapore EDITION hotel. It is being developed a tripartite group which involves CDL, Hong Leong Holdings, and together with Lea Investments. The project is being designed by Moshe Safdie with dual frontages facing along Cuscaden Road and Orchard Boulevard. It features 2 residential towers (28-storey each) and they will be linked with a Skypark at the top. The Skypark will consist of facilities for the residents are Boulevard 88, such as the infinity pool, gym, and lounges etc. Sitting on the site of the former Boulevard Hotel, the new development is within close proximity to Orchard MRT station and the upcoming Orchard Boulevard MRT station (as part of new Thomson-East Coast MRT line). According to reports, the 2-bedroom plus study unit (1,313 sq ft) is being priced from $4.4 million, $6 million for a 3-bedder (1,776 sq ft) and 4-bedroom units (2,756 – 2,799 sq ft) are selling from $9.6 million onwards. Boulevard 88 also has 4 penthouse units (sizes ranging from 5,673 to 6,049 sq ft) – pricing is set at between $30 million to $32 million. CDL commented that the group is pleased with the sales result which was achieved in less than 2 weeks. 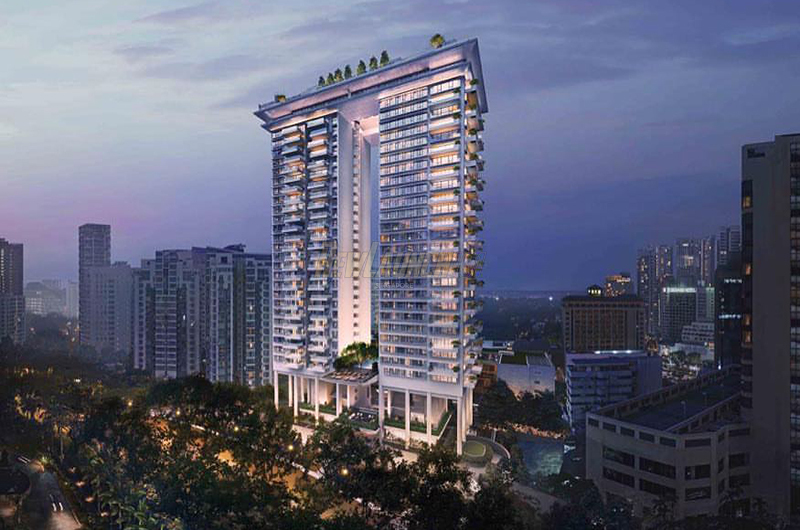 It believes that new freehold luxury residential projects in Singapore like Boulevard 88 are rare to come by and it is set to benefit from the rejuvenation and transformation plans for Orchard Road.